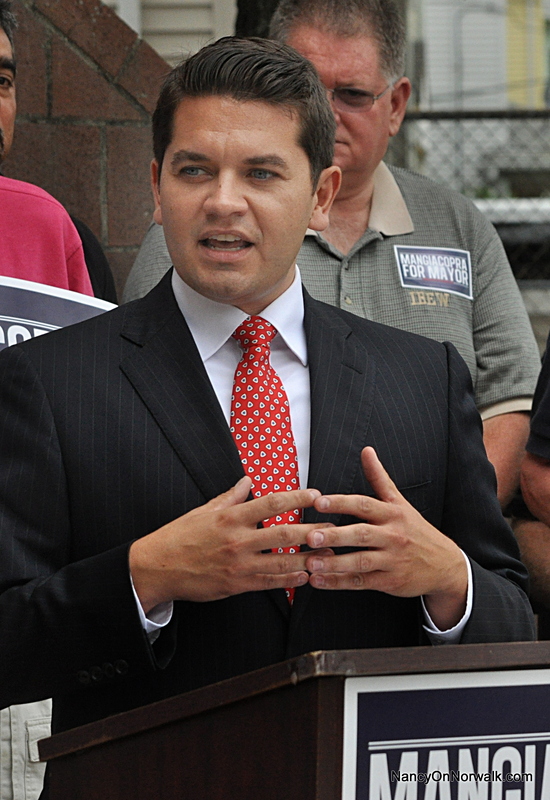 Norwalk Democratic mayoral hopeful Vinny Mangiacopra has lined up labor union support. Update 7:23 p.m. Aug. 29: Rilling campaign issues a response to the comment that Harry Rilling has no union endorsements. NORWALK, Conn. – Democratic mayoral hopeful Vinny Mangiacopra has picked up his seventh and eighth labor endorsements, earning the support of the Operating Engineers Local 478 and Roofers and Waterproofers Local 12, according to a Wednesday press release from the campaign. Both unions have pledged financial support and boots on the ground for get-out-the-vote drives. The Operating Engineers Local 478 is one of the largest unions in Connecticut, representing 3,047 workers. Mangiacopra, thus far, has virtually cornered the market on union endorsements for the Sept. 10 Democratic primary election. Andy Garfunkel picked up the backing of Laborers’ Local 146 last spring. The Harry Rilling and Matt Miklave websites list no union endorsements. At best, this seems like useless propaganda. Both of the “unions” are based in New Haven County – wow some surprise – how many members live in Norwalk? How many will show up to help? Here’s a perfect Union slogan: do no more than required. Is this what Norwalk taxpayers want or need. Take your union endorsements and put em in a pipe and smoke em! If Mangiacopra is getting big union’s votes, you know who not to vote for as a Norwalk taxpayer. We already have the 5th highest paid teachers in the state and below average test scores. Now we will be lucky enough to have all of Mangiacopra’s union buddies receive double what the market pays for “projects” around the city. The corruption is disgusting. How come Harry doesn’t have any union support? Editor’s note: The Rilling campaign responded to the story. We updated the story at 7:25 p.m. with the response. Norwalk needs change, Mangiacopra for Mayor!! Unions and $$$ win Democratic Primaries. Mr. Mangiacopra has them both. Watch out Mr. Rilling…. In a City that has the highest cost of providing municipal services (salaries) in the state its comfortable to know that a Democratic candidate is having great success courting the “union vote”. If elected the unions would have an even better friend in City Hall than at present. What many Democrats fear is that Democrat control of City Hall would simply replicate what Democrat Governor Malloy and his super-majority Democratic control of the legislature have achieved. Candidate Mangiocopra might want to skip over “leading Norwalk to the future” and assist Governor Malloy in reinventing Connecticut as a failed state. Mr. Mangiocopra ought to read the report of the Arbitration Awards Committee on the disastrous effects of Norwalk’s astonishingly high compensation and benefits to its union workers. Union support is the very last support that a sensitive and knowledgeable candidate needs running for Mayor of Nowalk. @piberman, you need to win to make change. As I know you are aware, taxes have crept up every year Mr. Moccia (R-NWLK) has been Mayor. Every one of these D candidates needs to dance their way through a constituent flooded Primary maze. We can all debate who has the skill set and fortitude to make the changes our City desperately needs, but lets not debate what is obvious; you can’t win a D Primary acting like a Reagan Republican (even if that is exactly what the City requires). Real proposals and real change happens when you hold the seat. None of the candidates nor elected Norwalk Mayors in modern times ever had major league business management experience prior to taking office. Nor were any considered CEO material when they left office. We’ve had musicians, town clerks, city clerks, guys without college, with college, etc. So expecting a candidate with the managerial knowledge to make needed changes in how our City is run is “whistling Dixie”. But what we can do is encourage candidates to list a set of promised changes and then if they are elected hold their feet to the fire. Knowing that the public expects those campaign promises to be kept we’d expect the Mayor elect to seek out competent managers to help implement the needed changes. For example, bringing in major league financial expertise to chair the BET. Maybe make some Dept. Head changes. Maybe let it be known that most budgets will be smaller next year and those who’d like to seek opportunities elsewhere are invited to look. We have some major league financial talent in Norwalk. Some of the best heads in the nation. If asked some might volunteer to help out. But they haven’t been asked. Take a look at what happened when the BOE changed attorneys (suggested by Dr. Marks ! ), chose the top ranked school attorney in the state and won an astounding $2.6 mil. freeze all based on presenting evidence that teachers were the 5th highest paid in the state. And had been for a long time. What would it take to replicate such “bold labor relations” at City Hall ? Some different but highly motivated folks willing to shake the tree. and it brought victory. Malloy used the same brain trust of advisers to win the Governor’s seat. And mayoral campaigns in all of CT’s major cities have used the same approach putting together detailed reform plans. At day’s end a savy mayor elect is the head of a political party hopefully with a team of savy advisers ready to go on day one to implement their “plan”. From what I’ve heard and read each of the candidates is motivated to win but none have a detailed plan of what they plan to do. That’s neither the path to victory nor the path to a better governed City. Frankly its discouraging. Has any candidate said the following ? 1. NEON is a bloody mess and I plan to clean it up and make us proud of how NEON operates ? 2. Our taxes are punitive and depressing property values. I plan to hold taxes unchanged for the first year to let everyone know things are being done differently in Norwalk. 3. All my Department Heads will get zero raises next year unless they can show major savings. 4. I plan to reduce the size of the City labor force by “x” percent in each of the next two years without reducing services. 5. I plan to have a formal review of our P&Z regulations and appoint the very best and most knowledgeable citizens. 6. I plan to revitalize Norwalk’s harbor and make it the most attractive on the Sound ? I could go on but most high school kids could draw up a list of goals for improving Norwalk or any City government. At day’s end successful Mayors are able politicians who attract able teams ready to make real changes and improve our governance. So far each of the 4 candidates haven’t got beyond the “buzz words” to develop real thoughtful agendas of what they intend to do. Its heart braking. Our City’s well being depends on having two vital energetic political parties and highly motivated and thoughtful candidates. It’s not just a “campaign”. Running for mayor should mean more than just “running for Mayor”. Where’s the team of advisers, the thoughts, the plans, position papers, etc. Why should anyone think they can do better than our present 4 term Mayor (who has no shortage of accomplishments) just by getting a nomination ? Candidates tell us what you’d plan to do. Gives us 10 minutes of thoughtful discourse. Maybe 15. Let us read something. Give us a reason to expect you’d be successful. For Heaven’s sake show us a well thought out OpEd of what you’d like to do demonstrating some familiarity with the problem. It may seem hard to believe but some 20 or 30 years ago we expected candidates to write a series of OpEds demonstrating that they be taken seriously. Along with their advisors do the same. Our “debates” back then were taken seriously. You had to know the City budget and cite chapter and verse. So it could be done. Didn’t the police union back Moccia last time? Norwalk’s unions don’t want to burn bridges with anyone, especially if they are in contract negotiations with Moccia. New Haven County unions can endorse Vinny without risk of offending the politicians they answer to. Yes the police union did back Moccia last time. It seems Moccia was guaranteed the support of the police union this time also with that stunt he pulled of appointing a new chief from the failures if the NPD with Zero search for the best candidate. However the monkey wrench for that is now that the former police consultant Rilling is in the mix. I guess none of really matters as the police union support means zero as most cops don’t live in town and Rilling will not be the dem on the ticket.